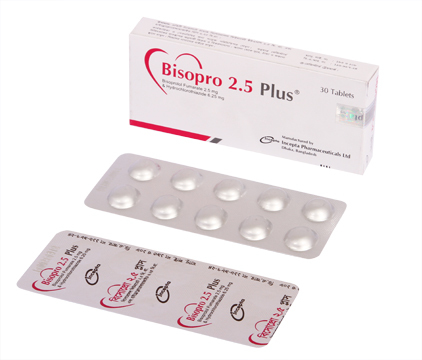 Bisoprolol is an effective treatment of hypertension in once-daily doses of 2.5 mg to 40 mg, while hydrochlorothiazide is effective in doses of 12.5 mg to 50 mg. In clinical trials of bisoprolol/hydrochlorothiazide combination therapy using bisoprolol doses of 2.5 mg to 20 mg and hydrochlorothiazide doses of 6.25 mg to 25 mg.
Generally well tolerated. Most side effects have been mild and transient. Normally fatigue, dizziness, headache, bradycardia, arrhythmia, peripheral ischemia, chest pain, palpitations, rhythm disturbances, cold extremities, claudication, orthostatic hypotension, diarrhoea, constipation, nausea, dyspepsia, rhinitis, pharyngitis etc. may occur. Dryness of mouth, thirst, weakness, lethargy, drowsiness, restlessness, muscle pains or cramps, muscular fatigue, hypotension, oliguria, tachycardia, and gastrointestinal disturbances are potential syndrome of fluid and electrolyte imbalance. Dilutional hyponatremia may occur in edematous patients in hot weather; appropriate therapy is water restriction rather than salt administration. Hyperuricemia or acute gout may be precipitated in certain patients receiving thiazide diuretics. 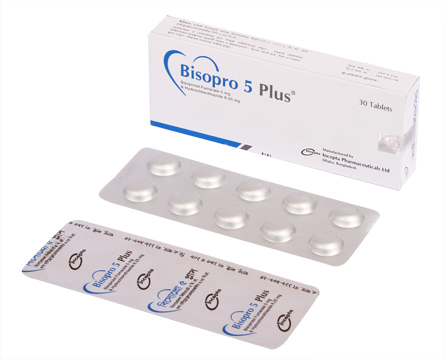 Bisoprolol fumarate, alone or in combination with hydrochlorothiazide, has been associated with increases in uric acid. Nursing Mothers: Thiazides are excreted in human breast milk. Small amounts of bisoprolol fumarate (< 2% of the dose) have been detected in the milk of lactating rats. Because of the potential for serious adverse reactions in nursing infants, a decision should be made whether to discontinue nursing or to discontinue the drug, taking into account the importance of the drug to the mother. Use in Pregnancy: Pregnancy Category C.
Geriatric Use: No overall differences in effectiveness or safety were observed between these patients and younger patients. Other reported clinical experience has not identified differences in responses between the elderly and younger patients, but greater sensitivity of some older individuals cannot be ruled out.